Expectations..Expectations and more Expectations..This is how one looks forward to the music of "Hamari Adhuri Kahaani" and why not, after all its a Mohit Suri venture who brings out the best from the stable of musicians like Mithoon, Ankit Tiwari and Jeet Gannguli to name a few, its him who made Arijit Singh and Ankit Tiwari a household name with 'Aashiqui 2' and 'Ek Villain' , with whom one associates some soulful, excruciating music since the Director inception in Bollywood with 'Zeher' in 2005, and since then he had swayed and stormed the music lovers with some chartbuster soundtracks regardless of how his movies fared on the box office. All said, the stakes are very high where Jeet Gannguli, Mithoon and Ami Mishra are at the helm of affairs, with 4 originals and 2 reprise versions, let’s dwell inside the dream world of these artists! "Music is the soul of the movie, the songs are an integral part and I don't think there is a better way to describe the film than the title song"
Jeet Gannguli starts of the proceedings with the title track "Hamari Adhuri Kahaani” with soothing piano and acoustic guitar notes in tandem with a haunting violin (played by Suresh Valvani) and some beautifully arranged interludes, the flute piece at the end deserves a special mention. THE Arijit Singh instils his soul in the composition and makes one feel the pain where Rashmi Singh and Virag Mishra brings forth some agonising work with the pen. The composition with duration of 6:38 never has a dull moment and the best part comes in form of the high pitched renditions and the arrangements. It forms the crux of the films narrative and should be heard at several crucial junctures in the movie. It is one of those compositions that will grow immensely post the movie release. Surprisingly Jeet Gannguli comes behind the mike for "Hamari Adhuri Kahani (Encore)" when everyone was cheering for Mohammad Irfan. This one is no different from the original one by Arijit from the music to the lyrics to the arrangements, everything remains the same. Jeet does a good job as a singer with his soft and easy on ears vocals but to be honest his voice falters and sounds a bit odd in the high pitched notes, may be some other established singer would have evoked more emotions out of this intense composition. Mithoon's "Humnava" lands in the familiar territory of his previous compositions with his trademark unplugged style and can challenge the composers very own 'Banjaara' (Ek Villain) being the overall situational feel of this one quite similar to it. The composition flows like a soothing poetry with the textured vocals of Papon beautifully interwoven around Sayeed Quadri deep rooted lyrics that strikes a chord instantly. A special mention to the singer Papon who has a classical touch in his renditions (consider the alaap portions here in the first interlude) and at the same time has a fresh and youthful charm which makes me wonder why he is not used often in Bollywood since he made his debut with 'Jiyein Kyu' (Dum Maaro Dum-2011) followed by the super gorgeous 'Kyon' (Barfi!) and more recently the sublime 'Moh Moh Ke Dhaage' (Dum Laga Ke Haisha) to name a few. Neverthless, it’s the highlight of the soundtrack and is here to rule the charts for months to come keep this one on loop and feel the love! 'You meet someone special, fall in love and before you know it, they become your world'. Lyricist Kunaal Vermaa describes this beautiful feeling of being in love with "Hasi" (use of the word 'Hasi' works pretty well) and the end result is intoxicating. Composed and sung by debutant Ami Mishra, this melodious outing has a soft-rock vibe (very similar to Pakistani rock bands) attached to it courtesy the drum beats and the extended climax which offers electric guitar riffs for the last one minute. Close to four minutes, the song keeps one wanting for more and while one waits to see it rise in popularity in days to come, one can be sure that this is one song that has in it to enjoy a long shelf life. An unplugged reprise version "Hasi (Female)" spellbound the listeners where Shreya Ghoshal's sugar coated renditions oozes love and romance with each and every word and transports the listeners in a dream world of pure love. The best thing about this version is the complete change of lyrics from the original one which is always a welcome change, also one can’t resist the magical flute part in the only interlude which leaves the listener in trance and stand still mode..Speechless! "Ye Kaisi Jagah" composed by Jeet Gannguli is a situational composition that has a nice simple melody flowing with it. Rashmi Singh and Virag Mishra bring forth the emotions and feelings of a married woman who has fallen for someone else and is in a state of dilemma; certainly the lyrics are the highlight of this composition. Debutant Deepali Sathe creates a soothing ambience with her renditions and Jeet Gannguli can be heard for some great classical alaap portions in between that generate a 'wow' factor. A good number that would look great alongside the narration. 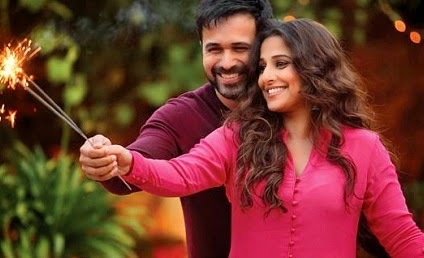 To sum up, "Hamari Adhuri Kahani" is by far the best soundtrack of 2015 that portrays intense love and touches the soul. Each song has a story flowing with it and is an integral part of the film's narrative. 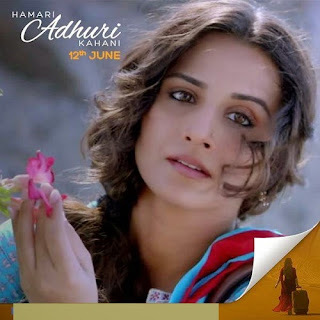 Although this one is not at par with 'Ek Villain' and 'Aashiqui 2' but with almost a month for the movie to hit the big screen, one can be sure that the compositions will be loved by the masses especially those who like their music to be soft, simple and full of romance. Whilst the title track will become a rage post the movie release, 'Humnava' and 'Hasi' will catch instant attention.